MOSCOW --- The serial-produced Ilyushin Il-76MD-90A, a heavy upgrade of the Il-76 military transport plane, performed its debut flight on November 7, CEO of the Ilyushin Aircraft Company Alexei Rogozin said on his Facebook page. "The Il-76MD-90A is the second generation of Il-76 military transport planes. The first flight was made in September 2012 and the first evaluation flight to test its compliance with the Defense Ministry’s requirements was conducted in December 2016. 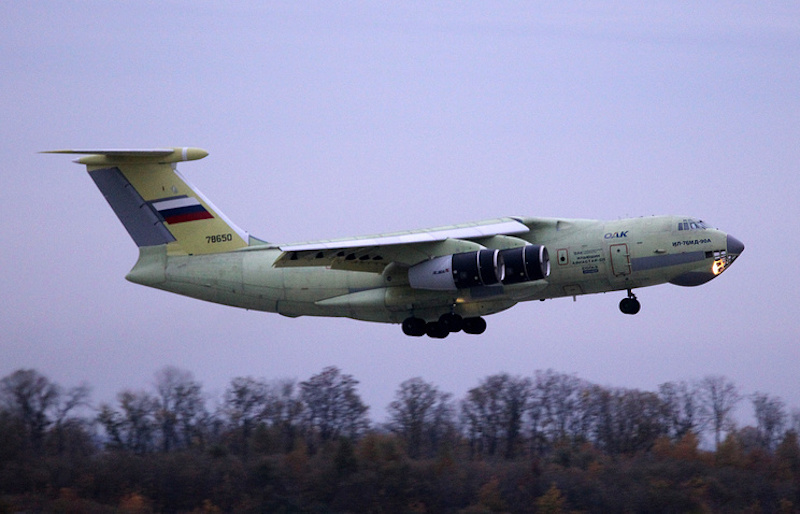 Yesterday, this was the first flight of the Il-76MD-90A with the factory No. 01-09 - the first serial-produced plane built in compliance with the performance characteristics of the Russian Defense Ministry," Rogozin said. The Il-76MD-90A produced at the Ulyanovsk-based Aviastar-SP enterprise is a heavily upgraded version of the Il-76MD military transport plane. The plane’s new version is outfitted with the PS-90A-76 engines that help reduce fuel consumption by 10%. The plane can carry a payload of 52 tonnes and operate at a distance of 5,000 km compared to 47 tonnes and 4,000 km, respectively, for the Il-76MD. It is capable of carrying a greater number of transportable and air-droppable military hardware. ZHUHAI, China --- A Mil Mi-38T transport and troop landing helicopter being developed on an assignment from Russia’s Defense Ministry performed its debut flight on November 3, Head of Russian Helicopters Group (part of the state hi-tech corporation Rostec) Andrei Boginsky said at the Airshow China on Thursday. "On Saturday, the Mi-38 helicopter developed for the military made its first hovering," Boginsky said. The helicopter prototype was made at the company’s expense on the Defense Ministry’s technical assignment, he added. "We have a contract with the Defense Ministry on the delivery of two Mi-38s next year and we are just doing the work to implement this contract," he said. The Russian Helicopters rotorcraft maker considers increasing the weight of the Mi-38’s underslung cargo from the current 6 to 8 tonnes, thus expanding the possibilities of its use for the military, he noted. The Mi-38 medium multipurpose helicopter holds a niche between the Mi-8 and the heavy Mi-26 chopper and can be used to transport cargoes and passengers. It can be employed as a search-and-rescue rotorcraft and for flights over the water. The Mi-38T (transport and troop landing) is a military version of the Mi-38. The helicopter in its military configuration is equipped with new highly efficient domestically-produced TV-7-117V engines and an integrated digital pilot navigation system. Russian Helicopters Group CEO Andrei Boginsky earlier said that the company planned to deliver the first Mi-38T helicopters to the Army in 2019.